Strongwell recently hosted its Annual Company golf tournament at Steele’s Creek in Bristol, TN. 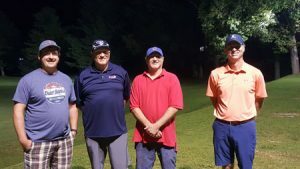 Over 30 individuals from various departments (customer service, sales, marketing, engineering, fabrication, machining, shipping, production, and estimating) participated amongst 8 teams in an 18 hole (Captain’s Choice, Best Shot, Scramble) Format. The first nine holes were played in the daylight and the last nine were completed in the dark with glow-in-the-dark golf balls and phosphorescence markers and decorations. Awards were also presented for first place, second place, longest drive, and closest to the pin. First Place Tournament Champions: Doug Edwards, Mark Haynes, Ronnie Sneed, and Andy Carter. Runner-Up: David Gibbs, Tyler Goad, Benny McElyea, and Rodney Banks.